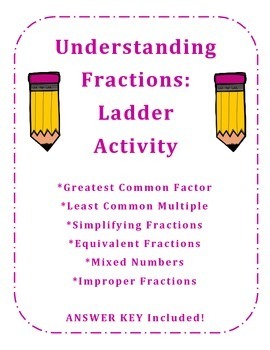 This Ladder Activity consists of 6 half-sheets with 6 problems each (*Answer Key included!). Students complete the first page (individually, with a partner, or in a small group); students raise their hand when finished so the teacher can check their answers; if the answers are correct, then students receive the next set of problems; if a problem(s) is incorrect, then students get an opportunity to continue to revise their work until all problems are correct; and so on until all 6 sheets are completed correctly. The pages can also be used as homework, review worksheets, or assessments. *Greatest Common Factor - List the factors of each number. Circle the greatest common factor of each pair. 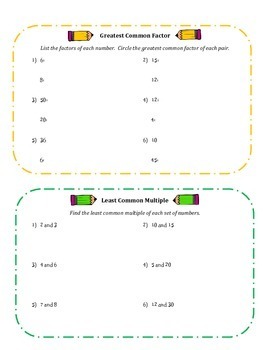 *Least Common Multiple - Find the least common multiple of each set of numbers. *Simplifying Fractions - Write each fraction in simplest form. 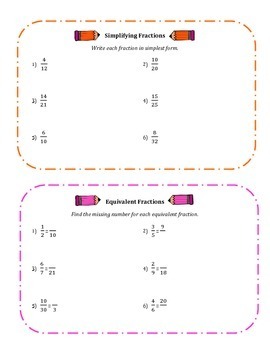 *Equivalent Fractions - Find the missing number for each equivalent fraction. *Mixed Numbers - Convert each improper fraction to a mixed number in simplest form. 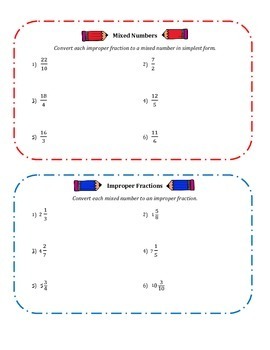 *Improper Fractions - Convert each mixed number to an improper fraction.